Get the best auto repair service in Allen, Texas by ASE certified mechanics and I-Car certified body shop technicians at Linear Automotive's complete service center. 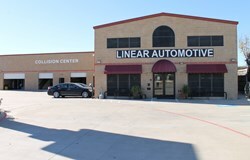 Linear Automotive has recently expanded services for people in Allen, Texas to offer certified general auto repairs, regularly scheduled factory maintenance, and a body shop featuring a full service collision repair center complete with an Italian style down draft paint booth that provides a showroom finish for all makes & models, both foreign and domestic. The best certified auto repair in Allen, Texas. Linear Automotive has been expanded recently. Upgrades have been made to accommodate the growing demand for quality certified auto repair in Allen, Texas. A state of the art computerized frame machine is used by I-Car certified technicians on vehicles that have been in an accident or major collision to pull the frame back into factory specifications. New hydraulic lifts have been added that raise the vehicle off the ground so the ASE certified mechanics can service the vehicle properly when performing auto repairs and maintenance. This is especially important when the mechanic needs to show the customer any issues that might be going on underneath the vehicle. When a mechanic is explaining a problem to a customer concerning any auto repair that needs to be done, it is always beneficial to show them what the issue is, because a picture is worth a thousand words. Having the best tools and equipment for auto service enables this shop to provide superior service and quality which is why it offers the best auto repair services in Allen, Texas. Linear Automotive is a premier auto repair and service center for the cities in North Dallas due to its fully certified services which utilize genuine OEM parts, affordable prices that save money, and five star customer service. Any person looking for auto repair in Allen will find that this shop rivals dealer services which is why it is often referred to as an Allen Dealer Alternative. As an example, a person with a BMW has made a significant investment, and will most likely go to the dealer for auto repair and services such as factory scheduled maintenance. What many people do not know is that the expert mechanics and technicians performing auto repair services at Linear Automotive have the same ASE certifications as the dealer. The huge advantage is that the labor rates at Linear Automotive are really great. This means anyone can get the same auto repair and factory scheduled maintenance services a dealer provides while saving time and money. ASE certifications are important because it allows the factory warranty to be upheld and continue in good standing, the same as if the dealer performed the auto repairs. If anyone is searching for an auto mechanic in Allen, the wise choice is Linear Automotive, because the certified auto repair work keeps up the factory warranty. Many factory warranties specify that regularly scheduled maintenance is required so the warranty is not voided. The ASE certified auto repair mechanics and technicians at Linear keep a vehicle up to date. This is important to know when someone is trying to choose a quality mechanic shop for auto repair in Allen. Another new addition to Linear Automotive's services is towing in Allen. Just to be clear, the towing service is provided by a third party; however, the information for the towing company is on the website to provide more convenience and information for customers.